Before you make any big decision relating to an item that is cherished to you, it is good to go into the process knowing every option available to you and what happens along the way. 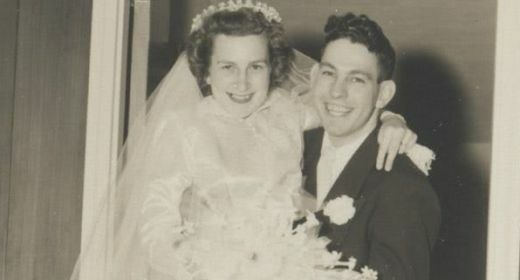 Sending your wedding dress away can be unnerving for brides unfamiliar with the process of online wedding dress preservation. What many brides don’t know is that sending your wedding dress away to be cleaned is many times safer and more effective than taking it down to your local dry cleaning service. More than likely, your local dry cleaners will also be sending your dress away since most lack the proper equipment and expertise to safely process the delicate fabrics that make up your beautiful gown. Why not save money and time by sending away your gown to be cleaned and preserved yourself? Below we’ll help answer other questions you may have about the process of wedding dress preservation and what happens to your gown after it is sent off. What Exactly is “Gown Preservation” Anyways? 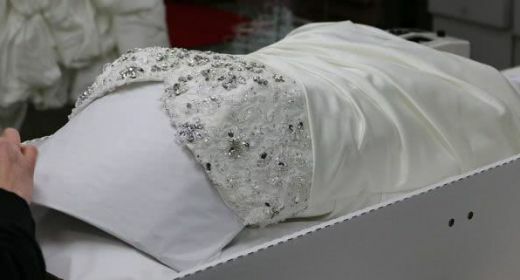 Simply put, wedding gown preservation is the process of cleaning and preserving a wedding gown after it is worn during a ceremony and reception. The process normally consists of multiple steps that not only inspect and clean the gown of visible and non-visible stains, but also includes a “preservation” process which protects the gown as it ages in the preservation chest and protects it in the event it is worn again. 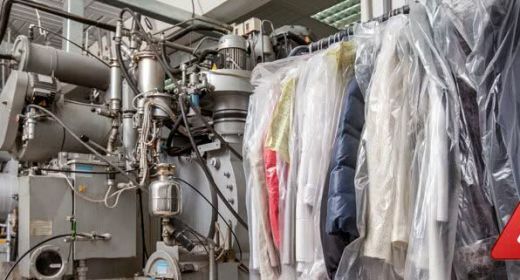 For many years this process was performed using simple cleaning agents and dry cleaning equipment, however, modern advances in the dry cleaning industry have allowed for special products and techniques to be developed that can remove everything from dreaded cooking oils to grass stains. Why Should I Have My Gown Preserved? Think about what happens on your wedding day. There are pictures to be taken, many times in fun locations such as an open field or beautiful outdoor setting. There is a lot of walking around, many times on dirty sidewalks, dance floors, and reception halls. There are family members to hug, food and drink to enjoy …you get the idea. Throughout the day your dress is put through the rigors of an average wedding day and often times you will accumulate dirt around the hemline, sweat stains under the arms, and food and beverage stains regardless of how careful you are during your amazing day. 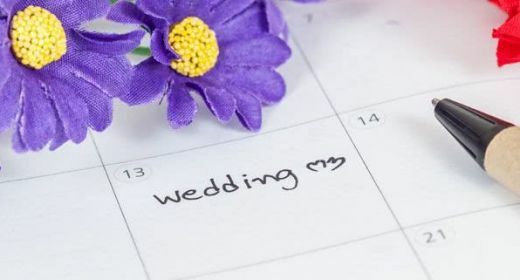 Having your wedding dress professionally cleaned and preserved will completely eliminate all the little (and big) blemishes that accumulate from your wedding day activities. Another big reason to have your gown preserved is yellowing caused by aging. Because your wedding dress is made from natural, delicate fabrics, those materials tend to begin to yellow and brown over time if left untreated. Having your wedding dress professionally treated will eliminate this yellowing and help keep your wedding dress looking as amazing as the day you first fell in love with it at the bridal store. Do I have Options When Having my Dress Preserved? Of course! 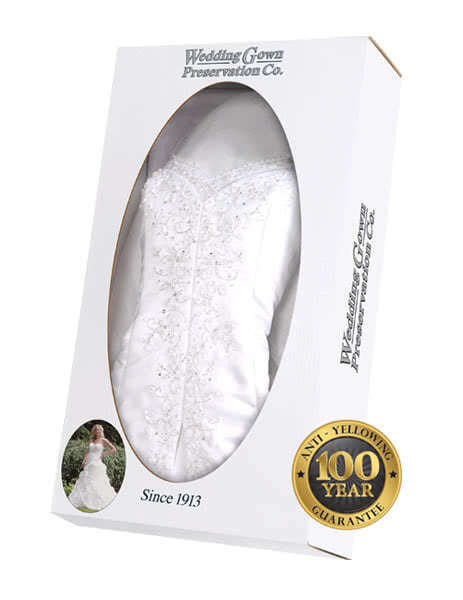 Both our Traditional Wedding Gown Preservation Kit and our Celebrity Wedding Gown Preservation Kit include options that allow you to personalize your order. First, you can choose up to 3 items to preserve with your gown. Some brides include their veil, some a pocketbook, and others have even preserved their wedding shoes! Along with preserving additional items you can also choose to personalize your kit with your name, photo or both. What better way to show your wedding gown to future generations than with a photo of you on your wedding day adorning your beautiful gown? How Long does it Take To Preserve My Gown? The preservation process takes a total of 6-8 weeks depending on the time of year. Our busy season is normally from July – October which can sometimes take a few weeks extra depending on volume. The reason it takes 6-8 weeks is that every dress that is preserved receives the utmost care from the time it arrives and is checked in at the preservation facility, to the time it is lovingly placed in the preservation chest and shipped back to you. Is Wedding Gown Preservation Safe for my Dress? 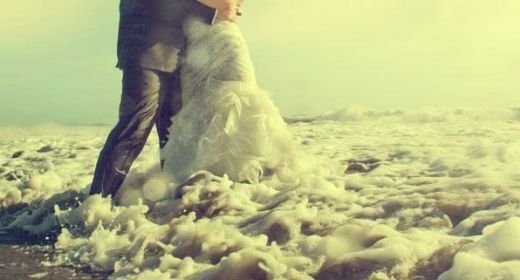 We are confident in saying that sending your wedding dress in to be preserved is as safe, or safer, than bringing it down to your local dry cleaning service. 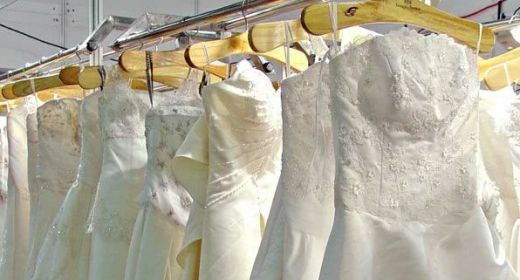 The fact is that 95% of dry cleaning services that advertise wedding dress cleaning & preservation services send their dresses away to be preserved to services like those offered by the Wedding Gown Preservation Company. The reason why is that most do not have the budget or the expertise to offer cleaning systems such as SYSTEM K4 that we utilize to offer the quality of service brides demand. We can say that for as long as we’ve been offering this service to brides, we have not had one lost gown in the mail. To be extra safe and protect our customers, each of our kits comes with a set amount of insurance to keep your gown extra safe during shipment. What are You Waiting for? Preserve Today! Did you know that your gown begins to yellow from the moment you purchased your dress at the bridal store? Did you also know that the longer you let stains absorb into the delicate fabrics of your wedding dress, the more they will set in? Sending your dress in today ensures you’re creating a family treasure that will be enjoyed and cherished for generations to come.